racing, racing for survival, racing for survival, city traffic driving simulator, off-road racing. 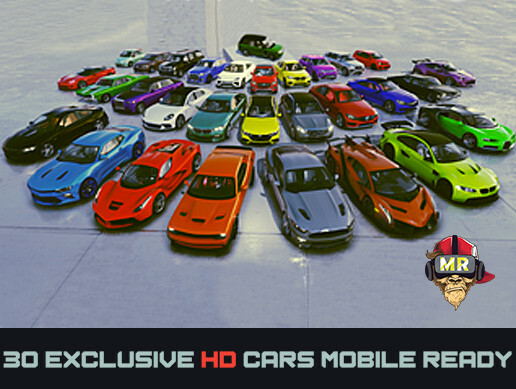 Highly detailed car models with textured interior. Optimized and ready for use in mobile games. Each model from a pack has finishing elements of a body: 4 wheels with brake disks, automobile salon, glass, wipers, a bumper, a wheel, a spoiler, speedometer arrows. Accident, with scatter or severe deformation of body parts. All models are perfect for racing, police chasing or birthday simulators. - Each car model is assembled in the finished prefab. - PNG texture for all elements of the car. - Models are correctly scaled and aligned along the Z axis. - A unique color palette for elite auto versions. - Clear and optimized car body geometry. - Unique spoilers, you can add / remove to any model. - Material material for each machine. All materials, textures and other parts of the package comply with the rules established in a single hierarchy. All models are ideal for games with a third-person appearance and for internal driving.